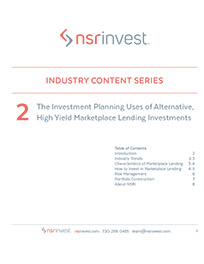 Your clients are curious about marketplace lending. Here’s how to answer their questions. 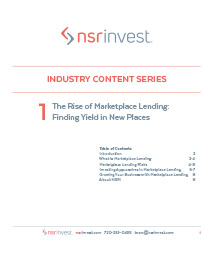 Here at NSR Invest, it’s part of our mission to educate others on all facets of marketplace lending. In this video, we thought it would be helpful to provide financial advisors a few tips on how to talk about this emerging field with their clients. To begin, we think it’s helpful to start with the banks. Your clients are likely familiar with a bank’s basic business model of earning big profits by making loans. It’s their bread and butter. But with the rise of marketplace lending, your clients now quite literally earn interest instead of the banks… they become the bank. In this way, your clients can profit by investing in the same type of loans that they themselves may have had in the past – say, their car loan or their mortgage loan – or like so many of us, our credit cards. Now, through NSR Invest, your clients can invest in a diversified portfolio of consumer loans, and become a direct lender, replacing the banks. There are three key benefits that may catch your client’s interest: the returns, the transparency and data-driven nature of online lending, and the overall benefit to our economy. First, investors have earned great returns from investing in marketplace loans. With platform returns consistently delivering 6-7% annually, I like to say that the returns speak for themselves. And NSR Invest clients are achieving even better results. Your clients should know, interest can be paid back to the investor on a monthly basis – which is great for those looking for consistent cash flow from their investment portfolio. For example, if your client invests $1,000,000 in our assertive strategy, and we generate a 9% annualized return, they could expect a check for 7 thousand dollars per month from interest income. That’s huge. Those are the kinds of returns we are talking about at the high end. Now, as you know, these results are not guaranteed. We have a great video on risks – and how we manage them – later in the series. Second, marketplace lending platforms are built on transparency, which adds to the reliability and security of the investment. All notes are registered with the SEC, and all loans are issued through an actual bank. These investment securities are now being purchased by tens of thousands of individuals to the tune of billions of dollars every year. Your clients should know: as investment adviser fiduciaries, we maintain full control over what notes are in their portfolio. We have access to hundreds of data points such as credit score, payment history, and verified income. When we choose a loan for your client’s portfolio, we’re using a sophisticated algorithm developed by our credit team, which has deep credit expertise and industry experience. Finally – investing in marketplace loans restores the fabric of our economy. Many borrowers looking to use alternative lenders are doing so to consolidate their credit card debt, or, to gain access to capital for growing their small business. Especially after the frustration many have with the slow-moving big banks after the financial crisis – we believe participating in this ecosystem this is a huge benefit to society. We provide intelligent access to this amazing new investment marketplace, and guard the individual investor as together we provide more efficient capital to the financial system. Better returns, lower cost to borrower, healthier society. A true win-win.